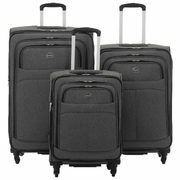 Scoot through busy airports and train stations with this lightweight 3-piece spinner set by your side. This DELSEY Bordeaux luggage sports 4 wheels that spin in all directions and an ergonomic, extendable locking handle so you can easily pull the weight. These upright suitcases expand to make room for anything you pick up along the way.